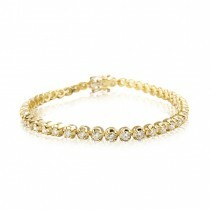 Diamond Bracelets & Bangles	There are 23 products. 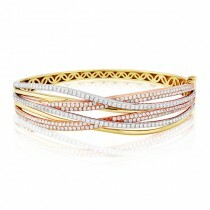 Six undulating rows of pavé set diamonds in white and rose gold span the top of this 18ct yellow gold bangle. The scintillating effect of so many diamonds on this impressive piece of jewellery will add glamour and sophistication to any outfit. 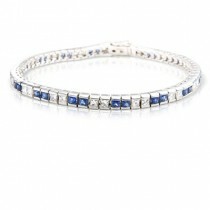 Hinged and clasped with a hidden safety catch, this bangle also features filigree decoration on the inside. 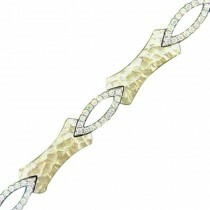 Stepping aside from the ordinary is this modern bezel set line bracelet. A full carat of round brilliant cut diamonds in marquise shaped links sparkle in a fine line around your wrist, The rose gold feature clasp is pavé set with even more diamonds for added interest. The clasp itself has a double safety fastening for extra security. This classic bangle contains 25 perfectly matched round brilliant cut diamonds with a total weight of 0.93cts in an elegant channel setting. 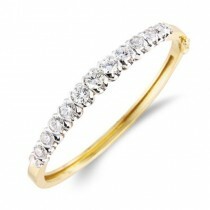 This is a solid gold hinged bangle weighing 19 grams. It features a hidden box clasp with an external safety catch. It is also available in 18ct yellow gold and in white gold..
his slim bangle is made in 9ct rose gold and features a fine row of round brilliant cut diamonds pave set into a channel. 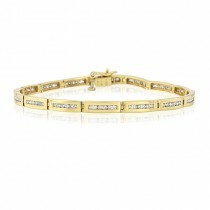 Fully hinged, this bangle has a box clasp with double safety catches. Gracefully intertwined on this 18ct bangle are two ribbons of rose and white gold, the latter being pave-set with two thirds of a carat of dazzling white diamonds. 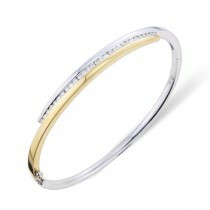 The bangle is fully hinged and comes with an extra, partly concealed safety clasp for extra security. Also available to order in other colours of gold. This classic bangle contains 25 perfectly matched round brilliant cut diamonds with a total weight of 0.93cts in an elegant channel setting. This is a solid gold hinged bangle weighing 19.4 grams. It features a hidden box clasp with an external safety catch. 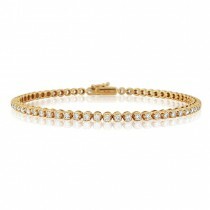 It is also available in 18ct yellow gold and in rose gold. 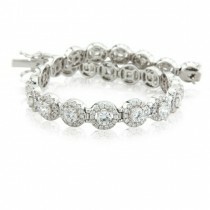 18ct white gold crossover line bracelet. 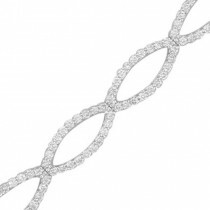 Two rows of elegantly curved links claw set with round brilliant cut diamonds. Total diamond weight 3.13cts. Even the clasp is diamond set and disguised as a link. Width approx. 7.5mm, total weight 14.4gms. Closes with a box catch and double safety clasp. 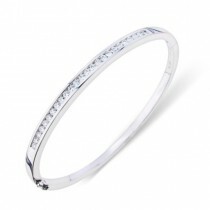 This exceptional bangle is 7mm wide and made of solid 18ct white gold; its sheer weight giving it a fabulous luxury feel. The top half is flush set with ten princess cut diamonds weighing a total of 1.07cts. It is hinged and clasped with a concealed double box clasp and features an additional safety catch. Gross weight: 53 grams. Hinged and clasped bangle claw set with 13 round brilliant cut diamonds graduated in size from 0.21cts to 0.51cts giving a total diamond weight of 4.08cts. Safety clasp. 18ct yellow and white gold.